Tinea pedis is a common fungal foot infection that is often associated with high rates of treatment failure or recurrence. This is often due to inadequate duration of antifungal treatment. In most cases, tinea pedis can be managed with topical antifungal treatment, however, oral antifungal treatment is sometimes required, e.g. 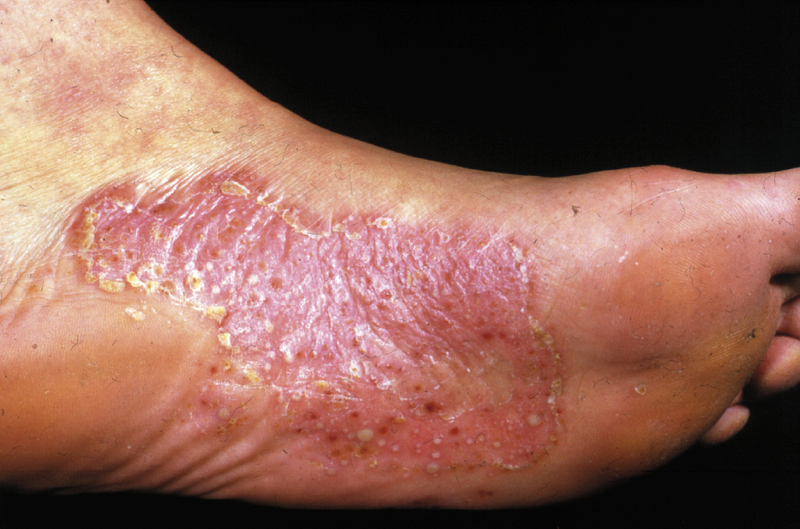 in patients with more severe infections, including moccasin tinea pedis, those with fungal nail infections and those with repeated topical treatment failures. Patients with tinea pedis typically present with itching, erythema and small blisters on one or both feet. Malodour is more likely to be due to bacterial infection. More specific signs and symptoms depend on the subtype of tinea pedis. Non-dermatophyte associated podopompholyx – a type of eczema which can affect the feet and may resemble a vesicular form of tinea pedis. It is more likely to be bilateral and symmetrical; mycology is negative. Palmoplantar pustulosis (see opposite) – typically characterised by scaly, partially or completely red, dry and thickened skin on the plantar surface of both feet, that is similar in appearance to psoriasis on other parts of the body.5 Note that psoriatic nail dystrophy often closely resembles onychomycosis. Skin scrapings for fungal microscopy should be undertaken when initial topical treatment has been ineffective, whenever considering oral treatment, or in patients with an atypical presentation. Skin scrapings should be taken from the leading edge of the lesion using a blunt scalpel blade or curette. Nail clippings should be collected from abnormal toenails. If there is clinical evidence of a secondary bacterial infection, e.g. malodour or maceration, swabs for bacterial microscopy and culture should also be collected. N.B. Potential bacterial infections include erythrasma which fluoresces coral pink under a Wood’s lamp (this can be done in the surgery) and is not responsive to antifungal medicines. For further information, see: “Collecting specimens for the investigation of fungal infections”, Best Tests (Mar, 2011). Management of palmoplantar pustulosis can be challenging and no treatment is curative. A recent systematic review reported that intermittent ultrapotent topical corticosteroids, e.g. clobetasol propionate, topical psoralen with ultraviolet A photochemotherapy (PUVA), acitretin and ciclosporin, appear to be the most effective treatments for symptom control.8 Referral to a dermatologist is generally recommended for patients with symptomatic palmoplantar pustolosis. For further information, see: “The treatment of psoriasis in primary care” BPJ (Sep, 2009). Miconazole cream 2% (fully subsidised): The patient should be advised to apply a thin layer of cream, twice daily and continue treatment for ten days after symptoms have resolved.12 Miconazole also comes in a range of other non-subsidised formulations, including powder, solution, spray, lotion and tincture (partially subsidised). Terbinafine may be used at a halved dose in patients with renal impairment (eGFR of less than 50 mL/min1.73 m2 ), if there is no suitable alternative treatment. Patients should be advised to return for assessment if the initial treatment is unsuccessful or if they have frequent recurrences of tinea pedis. If this occurs, take a skin scraping for a fungal culture (even if one was done at the initial consultation) to confirm that the patient has tinea pedis. Check compliance with the treatment regimen. It may also be necessary to investigate whether other members of the household have untreated tinea pedis, as this can result in re-infection from shared use of a bathroom or towels. Complications from tinea pedis can include secondary bacterial infections; it is a common predisposing cause in cellulitis. Patients with recurrent cellulitis of the lower leg should be examined for evidence of tinea pedis. Patients undergoing CABG with vein grafts from the legs should also be assessed for tinea pedis and treated prior to surgery to help prevent postoperative infection in the leg the vein was harvested from. Ilkit M, Durdu M. Tinea pedis: The etiology and global epidemiology of a common fungal infection. Crit Rev Microbiol 2014;[Epub ahead of print]. DermNet NZ. Tinea pedis. DermNet NZ, 2013. Available from: www.dermnetnz.org (Accessed Nov, 2014). Bristow I. Non-ulcerative skin pathologies of the diabetic foot. Diabetes Metab Res Rev 2008;24:S84–9. Ilkit M, Durdu M, Karakaş M. Cutaneous id reactions: A comprehensive review of clinical manifestations, epidemiology, etiology, and management. Crit Rev Microbiol 2012;38:191–202. DermNet NZ. Palmoplantar psoriasis. DermNet NZ, 2014. Available from: www.dermnetnz.org (Accessed Nov, 2014). DermNet NZ. Juvenile plantar dermatosis. DermNet NZ, 2014. Available from: www.dermnetnz.org ( Accessed Nov, 2014). DermNet NZ. Dermatitis. DermNet NZ, 2014. Available from: www.dermnetnz.org (Accessed Nov, 2014). Sevrain M, Richard M-A, Barnetche T, et al. Treatment for palmoplantar pustular psoriasis: systematic literature review, evidence-based recommendations and expert opinion. J Eur Acad Dermatol Venereol 2014;28 Suppl 5:13–6. British Association of Dermatologists (BAD). Palmoplantar pustolosis. Available from: www.bad.org.uk/for-the-public/patient-information-leaflets/palmoplantar-pustulosis#.VFGAPhZoRFc (Accessed Nov, 2014). DermNet NZ. Topical antifungal medications. DermNet NZ, 2014. Available from: www.dermnetnz.org (Accessed Nov, 2014). Crawford F, Hollis S. Topical treatments for fungal infections of the skin and nails of the foot. Cochrane Database Syst Rev 2007;3:CD001434. El-Gohary M, van Zuuren EJ, Fedorowicz Z, et al. Topical antifungal treatments for tinea cruris and tinea corporis. Cochrane Database Syst Rev 2014;8:CD009992. Bell-Syer SEM, Khan SM, Torgerson DJ. Oral treatments for fungal infections of the skin of the foot. Cochrane Database Syst Rev 2012;10:CD003584. Chang C-H, Young-Xu Y, Kurth T, et al. The safety of oral antifungal treatments for superficial dermatophytosis and onychomycosis: a meta-analysis. Am J Med 2007;120:791–8. DermNet NZ. Terbinafine. DermNet NZ, 2014. Available from: www.dermnetnz.org (Accessed Nov, 2014). Baxter K, Preston CL, (eds). Stockley’s Drug Interactions [online]. London: Pharmaceutical Press. Available from: www.medicinescomplete.com (Accessed Nov, 2014). DermNet NZ. Majocchi granuloma. DermNet NZ, 2013. Available from: www.dermnetnz.org (Accessed Nov, 2014). Phillipa Story said: 12/01/2015 7:38:27 p.m. The Editor said: 13/01/2015 8:03:44 a.m.